Lovely gilet with black faux leather shoulders and edging.it has 2 zipped front pockets.Good condition. 100% GENUINE & AUTHENTIC ZARA ITEM. Hooded puffer gilet with a zip-up front and front zip pockets. Hip length waistcoat. Round neck. Front buckle fastening. Composition – 77% Acrylic, 23% Polyester. Used, in very good condition. Lovely soft and warm Gilet. Front Fastening Hook and Eyes. One pocket on either side. Faux fur shell. Wool blend knit inside. Chunky Knit on collar. Zara basic black waist coat Size s (uk 10) Shoulder to shoulder measures14” Shoulder to hem measures 34” Chest measures 36” Has some bobbles but are hardly visible. Lovely waistcoat jacket. Size M 10 12. ZARA LEOPARD ANIMAL PRINT FAUX FUR VEST WAISTCOAT GILET WITH HOOD, SIZE M.
GORGEOUS LEOPARD PRINT HOODED VEST WAISTCOAT GILET. ZARA LEOPARD PRINT VEST. OUTER SHELL LINING 100% POLYESTER. WAIST - 53 CM / 21". SHOULDERS - 41 CM / 16". FROM PET & SMOKE FREE HOUSE. LENGTH FROM SHOULDER TO HEM - 79 CM / 31". Silk Blend. UK Size 10/12 - Label M. Underarm to underarm 45 17.55. Shoulder to Shoulder 36 14.04. ZARA BASIC Ladies Lovely Black Waistcoat. Fully lined fronts. 4 front pockets. ZARA BEIGE FAUX FUR GILET. zara Puffer Waistcoat Blue Size Large With Feathers Down. Dispatched with Royal Mail 2nd Class. Zara Faux Fur Hooded Tan/Neutral Waist Coat Gilet.BNWOT.BLOGGERS.SIZE S/M. New without tags. Stored in a vacuum bag. Zip fastening with pockets. Fully lined. Hood is also fur lined for extra warmth. Great for the cold snap of weather coming now! Moving abroad and downsizing so everything must go! All reasonable offers and questions are welcome. Listing new things until the end of the month! Keep checking back! Waistcoat with a lapel collar and contrasting, faux fur textured front pockets. Composition – 45% Polyester, 35% Acrylic, 11% Wool, 8% Viscose, 1% Cotton. Zara TRF Jacket. Shoulder to Hem : 28". Armpit to Armpit : 16". V-neck waistcoat with a high collar. Features side in-seam pockets and faux fur detailing on the hem. Composition – 75% Wool, 25% Polyamide. Lovely item, very versatile, easy to wear and dress up or down. Gorgeous Faux Fur Jacket with Pockets. Brown and black multi tonal faux fur gilet with a slip hot fastening. Faux fur - 62% Polyester, 38% Acrylic. Two small front pockets. 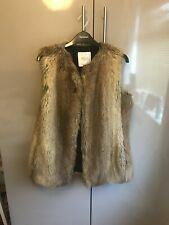 Zara Grey Fur Gilet Body Warmer Waistcoat Size M Medium Very Good Condition Thank you for looking! Please see my other items. A lovely Zara fur gilet in a size L around a 12 -14. STUNNING RUSSET EMBROIDERED & BEADED VELVET WAISTCOAT. 100% AUTHENTIC ZARA WOMAN PREMIUM DENIM COLLECTION REF: 6895/269. full length - 55 cm. outer shell - 100% polyester. armpit to armpit - 50 cm. embroidery - 100% polyester. Brown Beige Zara Fur Womens Gilet Sleeveless Waistcoat Hairy Winter Size Small S. Dispatched with Royal Mail 2nd Class. Long, crepe waistcoat with high lapel collar, side pockets, and hem with side vents. Composition: 64% polyester, 32% viscose, 4% elastane LINING 100% acetate. Zara beige ladies waistcoat. Small marks on left side please see pics. However not noticable when garment on due to collar. GREAT WAISTCOAT BY ZARA DRAPED FRONT IN BLACK. VERY GOOD CONDITION HARDLY WORN WILL 10/12 UK. Shoulder to hem 29". waist across 18". shoulder to shoulder 15". Lovely fur (4% wool) Gillet from Zara, size M, can fit 10 or 12, short sleeves, pockets, BNWT.